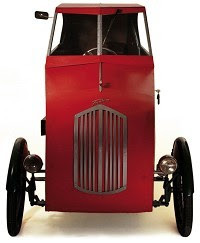 French car-maker Charles Mochet catered to people who had little money or simply didn’t hold a driver’s liscence. (If the car was small enough, in France, you didn’t need a permit to drive it. When petrol began to be rationed, he did away with the motor altogether, and added a set of pedals. This eventually evolved into the recumbent bike. 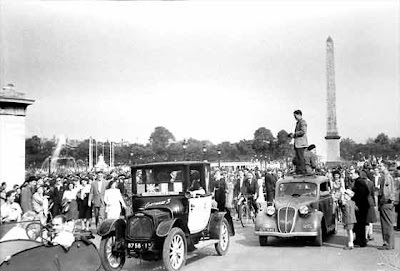 The fuel rationing that Bjørn mentions is not a 1970's fuel crisis, but the restrictions that were in place during the German occupation of France during World War II. As the aforementioned (and excellent) Microcar Museum notes, "It was the most sophisticated mode of transport available to a fuel-starved population, and owners were considered fortunate indeed." 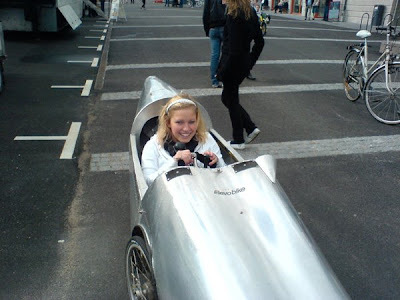 Called the "cykelbilen fantom" there are lots of photos of these hot little velocars if you abuse Google images a bit. As the Swedish velocars were built for courting, it is not surprising that they have a bit more visual excitement. This is too good an idea to die and, of course, there is an ocean of information out there about modern velocars. The epic Parnes HPV blog is in Swedish but it is well worth a visit to see lots of attractive Swedes piloting all manner of velocars, bicycles and recumbents. 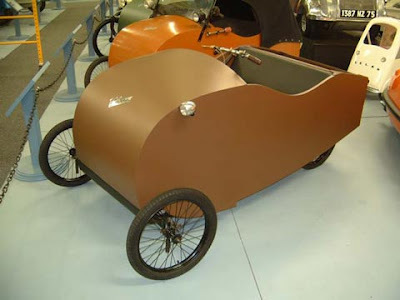 In a recent debate with my friend Phoenix, I made the case that recumbents, by design, were doomed to be dorky. Because they are so low slung, there is a mandatory need for the fluorescent orange safety flag to keep from being run over. Admittedly, I am still damaged by my mother's insistence that my Stingray be sullied with that damningly uncool safety flag - a tragedy that will forever color my opinion of the orange flag. After perusing the Parnes blog, I must admit there are some handsome looking recumbents.